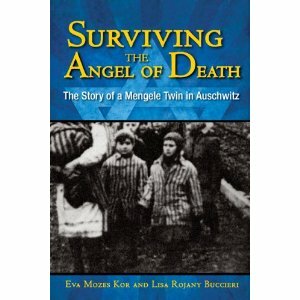 twice is nice: "Surviving the Angel of Death"
"Surviving the Angel of Death"
"Surviving the Angel of Death: The Story of a Mengele Twin in Auschwitz"
Eva Mozes Kor was just 10 years old when she arrived in Auschwitz. While her parents and two older sisters were taken to the gas chambers, she and her twin, Miriam, were herded into the care of the man known as the Angel of Death, Dr. Josef Mengele. Subjected to sadistic medical experiments, she was forced to fight daily for her and her twin's survival. In this incredible true story written for young adults, readers will learn of a child's endurance and survival in the face of truly extraordinary evil. The book also includes an epilogue on Eva's recovery from this experience and her remarkable decision to publicly forgive the Nazis.Through her museum and her lectures, she has dedicated her life to giving testimony on the Holocaust, providing a message of hope for people who have suffered, and working for causes of human rights and peace. A true story of the remarkable character of Eva, a twin who was determined to keep herself and her sister alive, even while undergoing severe physical abuse. The reader learns what it felt like to be a Jewish girl in a deadly environment, but is not overwhelmed by despair. As a reader, you come to admire Eva as she finds numerous ways to survive, relying on unusual strength, determination, and luck. Adapted from Eva Mozes Kor's self-published memoir, ECHOES FROM AUSCHWITZ: DR. MENGELE'S TWINS, THE STORY OF EVA AND MIRIAM MOZES, this book gives a heartbreaking view into two Jewish children's lives during the Holocaust. Though the subject matter is graphic and sensitive, Eva Mozes Kor's breathtaking ability to forgive Joseph Mengele for his atrocities, as well as her ability to overcome unimaginable cruelties, provide hope for all children who have gone through terrible experiences. Through the eyes of Eva, who is plucky and outspoken, we become acquainted with the close-knit Mozes family. They lived happily in Transylvania, Romania, and got along well with their gentile neighbors. As the war progressed, warning signs indicated that trouble was ahead. Eva's father suggested that they flee to Palestine, but his wife refused, since she loved her home and felt that the Germans would not bother to evacuate small towns. She did not take into account the legendary thoroughness of Hitler's willing executioners, and after the roundups began, it was too late to escape. When twins Eva and Miriam Mozes were ten years old, the Nazis invaded their home in Romania and forced their family onto a train that would take them to the Auschwitz concentration camp. When they got off the train, their family became separated. Eva describes the ride in the cattle cars to Auschwitz, the selections, the stench from the crematoria ("It reminded me of burned chicken feathers"), the roll calls, the starvation and thirst, the lice and rat-infested barracks, and the helplessness that she and her sister felt when their parents and sisters disappeared. Upon arrival at Auschwitz, their family became separated...they never knew what happened to their father and two older sisters, Aliz and Edit. Their mother, in a desperate attempt to save her youngest daughters, answered "Is that good?" after a soldier asked if they were twins. "Good" was a subjective concept, because Eva and Miriam were immediately torn from their mother's arms, and she was sent to the gas chamber while they were taken to the laboratory barracks for those who would become Dr. Joseph Mengele's experiments. This book is the story of how they survived the horrors that ensued. They both survived the concentration camp after over a year of abuse, starvation, experimentation, death and more all around them. They eventually make their way to Israel, after being put into an orphanage (being liberated by the Soviet Union) and took in by a fellow mother of twins that they knew. They even are able to find some family who help them as they got older. In 1984, Eva and Miriam founded a support group for people who had been victims of Mengele's sadistic experiments, and in 1995 Eva opened a Holocaust museum in Terre Haute, Indiana. She (Eva) is also known as the subject of a recent controversial documentary entitled "Forgiving Dr. Mengele" which highlights her ideas about justice, revenge and the possibility of healing through forgiveness. Kor and Buccieri include maps to help readers place the events and photos to help make the people seem more real. Though painful to read, Surviving the Angel of Death provides an informative first-hand account of the harrowing experiences of one set of twins at Auschwitz. I think Rojany-Buccieri did an outstanding job of taking Kor's memories and translating them into a story that will fascinate junior readers. Mature young adults with an interest in the Holocaust will learn a great deal from this slim volume. The black and white photos of Eva and her family, a smiling Josef Mengele, and a group of frightened and emaciated twins in the Mengele's laboratory are unforgettable. "Surviving the Angel of Death" might induce nightmare in sensitive youngsters. However, for those who have a basic understanding of the brutal events that took place during the Second World War in Europe, this clearly written, straightforward, and deeply moving book makes clear how Hitler and his followers gradually tightened the noose in preparation for the Final Solution. Ms. Kor, who does a great deal of public speaking, deserved credit for revisiting what must be excruciating memories in order to further her goal of spreading love and creating a world with "no more wars, no more experiments without informed consent, no more gas chambers, no more bombs, no more hatred, no more killing..."
Eva urges youngsters to avoid giving in to despair, since their dreams can come true and miracles do occur. It is heartening to note that this seventy-six year old woman who has been through so much continues to live an active and productive life. I would recommend this book for ages middle school to adult. Thank You so much Net Galley and Tanglewood Books for allowing me to read this book! I cannot wait to read more books from you in the future!